This blog post is going to explain how to route traffic on your host through a Tor Docker container. It’s actually a lot simplier than you would think. But it involves dealing with some unsavory things such as iptables. 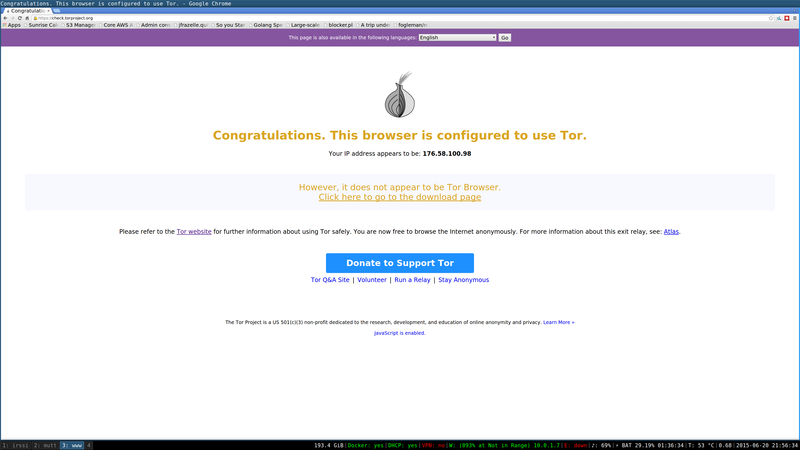 I have a fork of the tor source code and a branch with a Dockerfile. I have submitted upstream… we will see if they take it. The final result is the image jess/tor, but you can easily build locally from my repo jessfraz/tor. You do? Ok make a PR to this blog post. Contain yourselves, I am about to throw down some sick iptables rules. Check that we are routing via check.torproject.org.